Thanks to 30 Meals in One Day I got to review their products! With a busy household and people coming and going this set they sent to our family is perfect for us! The meals sound really easy and yummy. We can't wait to try all of them. I am excited that there are over 150 recipes in the Dinner is Ready book. 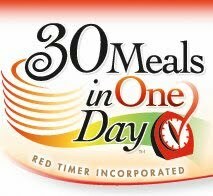 Thanks 30 Meals in One Day for the great products! Cook one day, then eat for a month! Every bit of instruction you'll need to make 30 Meals in One Day. More than 150 delicious freezer recipes! Dinner is Ready is a new cookbook designed to change your life. Learn to prepare 30 meals in just one day. 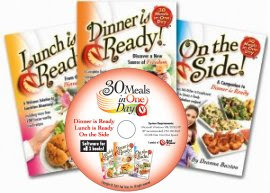 With easy to read and clear instructions, this book details every aspect of the process that will put 30 meals in your freezer in one day, a fraction of the time it would take to make each of those 30 meals individually. Don't have a day to spend in the kitchen? Choose one of the shorter options! With delicious dinners in your freezer - no matter how busy your day - you can always say "Dinner is Ready!" Beautiful 240 page 6" x 9" softcover cookbook contains clear instructions plus more than 150 freezer-worthy recipes (See sample recipes). No strange recipes. No strange ingredients. All simple, freezable and delicious. Easy to read, large print format. One recipe to a page. Anyone that orders before the winner is announced and ends up winning, they will refund your order. I was also given the coupon code CAROUSEL to share with my readers for free shipping on US orders. Ready book and software to a lucky winner! Giveaway ends on Tues. Oct. 26th, 2010! I am also a blog follower and Facebook follower. I would really really really love to win this one! right sidebar in alphabetical order. I have often heard about cooking for a month in one day...but have never come close to trying it. I'd love to win! I am a follow sister! I would so love to try this book! Wow this does sound really good. Any help in the kitchen is helpful. I reallly do enjoy eating home and would love to be organized about it. Thanks for putting my name in the hat. I'm a follower of your blog and would love to win this cook book. I'm a follwer on your twitter account. 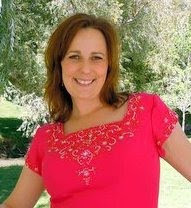 Hi, I have grabbed your button and put it on my blog. What a neat book...would love this one. I am a follower of all blogs. I have your buttons on my blog. This would be great to use. Would like to be counted in for this. This book sounds great...count me in! I have your Trying2StayCalm button on my blog! I own a large deep freezer so this cookbook is perfect for me. I'll cook and freeze. No problem. 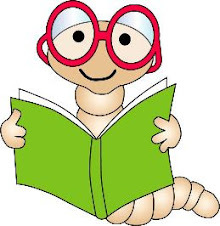 I would love this book! I need all the help I can get! I follow all your blogs! This would be a lifesaver. This would help me when I have no ideas for that meal. I would love to be entered. It sounds like a great cookbooks and the software sounds really useful. Sounds like a great book to cook from. I am planning to cook up a storm and freeze meals for after the baby is born. Awesome book. I could really use it. In fact, I need all the help I can get in the kitchen. Thanks for the chance to win a copy. I would love a chance to win!!! Freezer meals are great. I'd love to have this system with lots of new ideas. I posted on your positive thoughts button:-)...which I still just LOVE, by the way! This is a fabulous giveaway. Holy cow, could I use this! I'd love to be entered. What a wonderful prize! I would SO find it useful in my household! Sounds great I am in! Would like to win. Please count me in. Oh, this sounds great! What a great prize. Thanks for giving it away.